The official podcast of Ducks Unlimited Canada. Listen as we explore issues, ideas and research about wetlands in Canada. Wetlands are some of the most bio-diverse habitats in the country. Wetlands are vital to the health of a wide variety of mammals, birds, amphibians reptiles plants - and, of course human beings. We'll be interviewing research experts and frontline workers from Ducks Unlimited Canada in lively, engaging exchanges. They'll keep you up-to-date and up-to-speed on the best information and stories about these vital Canadian ecosystems. We're all about wetlands. Jump in. A map of Lake Ontario, like one in an old geography textbook, might miss Cootes Paradise. Without detail it can seem this great lake runs dry at western shore of Burlington, about 50 kilometres from Toronto. Some more careful maps have it end in Hamilton Harbour. But no, Lake Ontario fades out in a little 320 hectare triangle of marshland called Cootes Paradise. It’s really a river delta, but a remarkable one. On either side over two dozen streams, the largest being Spencer Creek, flow over the Niagara escarpment and the shallow basin. Once, those waters made this a hunting and fishing Mecca. Then its location at the head of the lake and some industrious canal work n the 1820s turned Cootes Paradise into a short-lived shipping lane. A century later it almost became an airport. It’s also been home to shantytown of “canal rats”, a ragtag community. Those homes, sometimes on stilts, clung to the marsh’s shores in the 1920s and 30s. Residents playing hockey on its frozen surface in the winter and sometimes hosted hobos from the railway that ran across the sandbar that separated it from Hamilton Harbour. These days, though, the shantytown is long gone. So are much of the indigenous plants and waterfowl. They’ve been upstaged by voracious carp and relentless phragmites and manna grass. In a canoe, as the sun creeps to the horizon, you can see the trouble in paradise. In the murky marsh, carp jump and shimmer. A paddle shaft vanishes from sight two feet down. High water a couple of years ago submerged a barrier that was to keep the bullying bottom feeders out. Now what was once so dense a marsh it was surveyed as land, is now open water. In 1941, when the environmental trouble from industrial and urban runoff was becoming obvious, the Royal Botanical Gardens was given stewardship of Cootes. It’s been a hard row to hoe for the environmental champion. Bad luck, climate change, urban expansion, oxygen-sucking algae have set the RBG’s plans of recovery by years. But there is a hero in this story, the man who’s in charge of saving paradise. His name is Tys Thysmeyer, the head of natural lands for the Royal Botanical Gardens. I spoke with him about his work and his passion for saving a remarkable wetland. 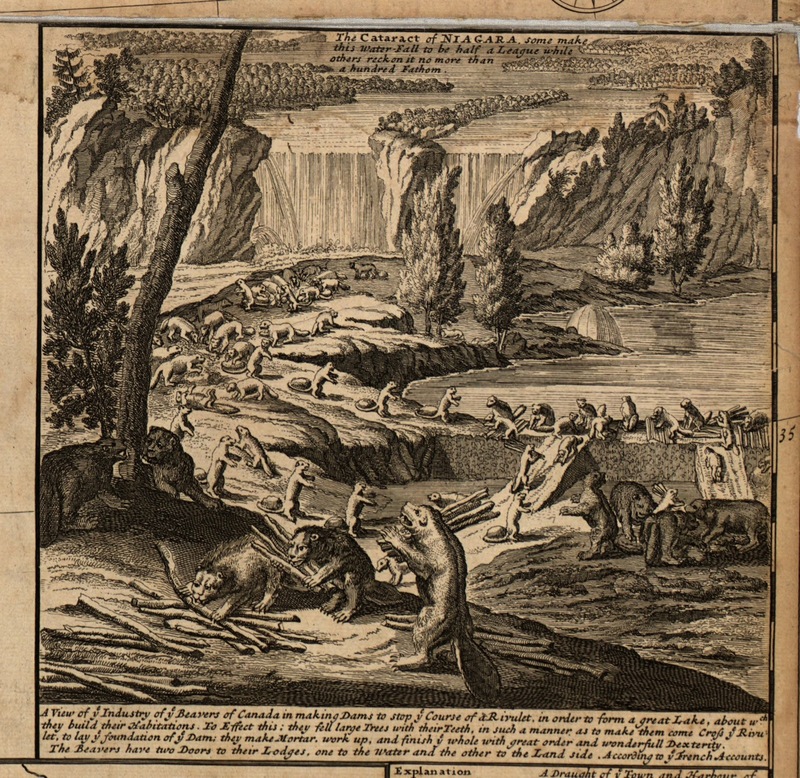 This episode begins with an engraving that was tucked into the corner of a 18th century map of North America, a beaver map. The engraving depicts an almost Hieronymus Bosch-like scene. One that’s a psychedelic, fever dream of beavers in Canada. In the background a bifurcated Niagara Falls tumbled into a broad river. In the mid- and foregrounds are rodentesque creatures, dozens of them. These are part beaver, part bear, part human animals that have the orderliness and industry of a work crew of navvies. Some carry logs on their shoulders like the seven dwarfs hefting shovels, some carry cowpats of mortar on their tails. Others seem to be barking orders from neatly constructed ramps. The beavers, an inscription on the engraving tells us, are building a Great Lake through their organized labour. To understand that map, and beavers' relationship with the landscape I spoke with Glynnis Hood, a professor of environmental science at the University of Alberta, Augustana Campus. Ducks Unlimited Canada folks, like many Canadians, have a relationship with the beaver that is, well, complicated. As Glynnis will explain, the fur trade almost wiped out the entire population castor condensis, our native species of the rodent. In the late 1930s Ducks Unlimited wanted to enlist beavers as ecological good soldiers. It encouraged a beaver comeback, that was pretty successful. But these days, loggers, folks in the oil and gas industry and cottagers have seen the reborn beaver populations flood their lands and thwart their industries. Even Ducks Unlimited Canada researchers find their wetland water control efforts confounded by busy beavers. I spoke with Glynnis about all of that, and how Canadians can best make peace with our little rodent friends. She's the Senior Conservation Ecologist and Senior Program Manager, Chicago Region at the Field Museum's Keller Science Action Center. Abigail's also a science translator, she turns research knowledge into practical actions citizens can take to conserve nature. And, Ms Derby Lewis is also the first of a series of folks we'll be introducing you to who turned their passion for conservation in careers, creativity and action in the community. Conservation of wetlands of course is near and dear to all of us at Ducks Unlimited Canada. But, we know we can’t tackle conservation alone and we’re happy celebrate our fellow travellers. Abigail became passionate about conservation when, as a nine-year-old girl she looked into the face of zoo-keep silverback gorilla. She went on to study primates all over the world. But, these days she's making certain that Chicago provides migrating monarchs the vital milkweed they need to feed and reproduce. I talk to her about the flight and plight of the monarchs, the role cities can play in providing those butterflies and other pollinators safe haven, and what you can do in your community to make certain that cities are habitable, not just for humans, but for the insects that are just passing through. Corixids, or water boatmen, are wetland insects with oars for legs and wings that can carry them kilometers from their homes when it's time to migrate. There white sucker, longnose sucker, and goldeye fish feed on the massive influx of food. In turn, they provide sustenance to the rivers' game fish. Srayko thinks the corixids provide a near invisible link between wetlands and the nearby rivers. They're one more reason why conserving wetlands helps a broader eco-system. Ducks Unlimited Canada does its own educational outreach through our Wetlands Centres of Excellence and Wetland Heroes programs. But this episode, we’re focussing on Archibald’s education through music. Archibald has been interpreting natural spaces with his music for 29 years when Bon Echo Provincial Park hired him to celebrate the petroglyph-famous campground in song. He has written for and performed on Sesame Street in New York and CBC's Mr. Dressup. But he’s also a music producer (he gave Avril Lavigne her first shot at a studio microphone) and is currently the musical director for a show about Stompin’ Tom Connors. You can find out more about David Archibald and his music at http://www.davidarchibald.com. We begin this episode 40 miles above the fertile fields of Alberta. From up here the rectilinear hashmarks of crop boundaries are pocked and dented by darker, irregular patterns, like raindrops pooling on a patio table. Those are pothole wetlands left behind by the scraping and gouging of the receding Wisconsin glaciation thousands of years ago. These days you’ll find these watery basins, often as many as 40 per square kilometre, all over the prairies in Canada and the U.S. But, when the glaciers receded their were many, many more of them, millions of them. They became an essential habitat for hundreds of plant, animal and insect species - especially at their margins. But in the last century humans have managed destroy a lot of those formerly abundant wetlands. In some places 70 per cent are already gone. Those that remain are often sometimes precariously surrounded by vast fields of canola, wheat or barley. But, in this episode we’re going to explore another advantage of prairie potholes. To do that, we need to get a lot closer to the ground. This episode is all about scum. Stinky, toxic, and beach fouling scum, better know as blue green algae. You’ve probably seen it in a pond or lake near you. It looks like someone changed their mind about painting their living room French Canadian pea soup green and dumped gallons of the ill-considered pigment into a nearby body of water. But, it’s not paint, it an early form of life on earth called a cyanobacteria. If the conditions are right, sunlight, high temperatures and lots of nutrients, especially phosphorous, those bacteria can multiply like samollena on luke warm chicken. The billions of bacteria cause what’s called a bloom, but not one that smells very sweet. And, when the bacteria die they can release a toxin that can cause kidney failure. In fact, in 2014 a blue green algae bloom in the west end of Lake Erie was so huge it caused the city of Toledo, Ohio to completely shut down its water system for fear of poisoning Toldeoans. But, ironically, if it weren’t for cyanobacteria billions of years ago nobody would be alive in Toledo, or anywhere else in the world. That’s because we have Cyanobacteria to thank for the oxygen we breathe. Cyanobacteria are biological survivors. Billions of years ago they were literally, the scum of the earth. They grew on land, rocks and in water - fresh and sea. They were early photosynthetic organisms. That means one of their waste products was oxygen, oxygen that until about three billion years ago was removed from the earth’s atmosphere as its surface iron rusted. But then, over the next 100’s of millions of years the rusting slowed down and oxygen started building up. So, if you like breathing, thank a lake scum. These days, we’re cyanobacteria’s best friends. Human activity has helped global warming, we’ve converted swamp and other wetlands into towns and cities or turned them to farmlands that dump phosphorus rich runoff into creeks and streams. We fertilize our lawns injudiciously and produce all manner of waste rich in the nutrients blue green algae eat like it was a free wedding buffet. To learn more about blue green algae and what’s being done to combat it I spoke with Katie Stammler. Katie is water quality scientist and source water protection manager at the Essex Region Conservation Authority. The Windsor Essex area is a short hop across the shallow Lake Erie from Toledo. It’s home to the world-famous birder’s paradise Peele Island and is a flat, fertile terrain full of streams, creeks and wetlands that feed the Great Lake. Katie and her team have worked with Ducks Unlimited Canada to save and nurture those wetlands. To date, DUC has completed more than 60 projects within the Lake Erie watershed and DUC’s Institute for Wetland and Waterfowl Research is implementing research, monitoring and outreach components projects in the area. Katie and her all-female crew, known as the Ladies in Wading, are the home grown heroes here. They also monitor water quality and educate the public about how not to succumb to the scum. This episode is all about things we bet you didn’t know. For example, bet you didn’t know goats and flea beetles went to a vegetarian restaurant together they’d probably order the same thing - Leafy spurge. But, that menu choice would be about the only thing that would go well on that date. What’s that got to do ducks? Leafy spurge is the bane of grasslands, like the one that surrounds a Duck Unlimited Canada managed wetland called Frank Lake in Alberta. We’ll find out how the dynamic dining duo of goats and bottles beat that noxious supervillian spurge. Next, our first serving of a scrumptious sampler of information sushi we’re calling Duckoids. Homewrecking ducks and sidewalk chalk coming up. Frank Lake is a restored wetland near High River Alberta. Waterfowl and shorebirds aplenty flock to its shores or nest in its surrounding prairie grasses, wild rose and scrub. It’s a delicate ecosystem sustained by water diverted from the Highwood River and a DUC, government and industry partnership. To wrap up, a brand new feature of this podcast we’re calling Ducktoids - facts about waterfowl that’ll knock your feathers off. This time out, we get those ducktoids straight from Scott Stephens. Scott is DUC's director of regional operations for Prairie Canada. Thirteen is the most unlucky of numbers, so it’s appropriate that this podcast is all about two unlucky wetland dwellers - the Northern Leopard frog and the Blanding’s turtle. Why unlucky? Because both are in ecological trouble. The northern leopard frog is endangered in parts of British Columbia, the Blanding’s turtle is threatened in Ontario. Take the northern leopard frog. Its habitat, which the little guys are pretty fussy about, is shrinking, bullfrogs are invading from the U.S. and the leopard frog is prone to a nasty, lethal fungus. As we’ll learn, it takes a egg-cursion from B.C. to Calgary and back again, to put the little “not-easy-being-green” amphibians on the road to recovery. The Blanding’s turtle with it high, helmet back and yellow throat is a distinctive turtle. It’s also a long-lived meandering one that ranges across roads and ATV tracks as it moves to nesting grounds. But those grounds are shrinking and the turtles, which can live to 75 years old are threatened by predators, cars, ATVs and even by climate change. Like ducks, both those fraught frogs and tenuous turtles live a good part of their lives in wetlands. So, as go the amphibians, perhaps, so goes the wetlands. To find out more about our loping and leaping wetland friends, and what’s being done to save them from territorial oblivion I spoke with two experts Lea Randall, an endangered species ecologist at the Calgary Zoo and Mark Gloutney with DUC, out of Ottawa. Eduardo Carrera is the CEO of Ducks Unlimited Mexico, DUMAC for short. Eduardo oversees a Ducks Unlimited team that tackles threats its country’s wetlands much the way a grassroots NGO would. Folks who live in poor rural Mexican communities often lack modern sanitation technologies. And, they’re not aware of the impact their waste water is having on nearby and fragile wetlands. So, to save those wetlands Eduardo and his colleagues provide those technologies and that education to teachers in the communities, students and even professionals who need evidence-based resources to help them understand ecological issues in Mexico and beyond. Meanwhile on the coasts of Mexico tourism and shrimp farming threaten mangrove swamps that are the winter homes to migratory birds including ducks from Canada. We spoke with Eduardo about the complex issues and ingenious solutions he explores every day. Meanwhile in P.E.I., Lucy is a stubborn black duck who, for the past few years has raises her family in the garden plants outside a Superstore in Charlottetown, PEI. When the kids are ready, Lucille, good mother that she is, waddles her brood to a set of ponds DUC created right across the road from the shopping centre. A road that the police close for the Lucy parade. The black duck is also a webcam superstar thanks to a video feed DUC fired up last season. We spoke with DUC's Jana Cheverie about the tale of migrating mother who’s made wetland education a family affair. If you’d like to learn more about Lucy’s story you can at ducks.ca/lucy. If we’re lucky, and she returns, her popular TV show will be there as well.